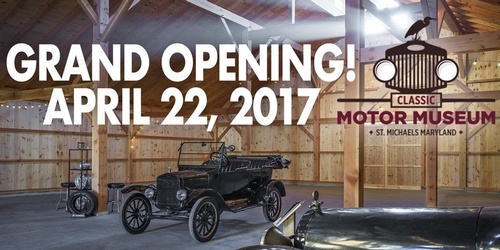 Saturday, September 22, 2018 10:00 p.m. - 5:00 p.m.
During the first annual AutoFest at the Classic Motor Museum, see the 1917 Maxwell Model 25 and meet the men who recreated the journey from New Jersey to California that their grandfather, C.W. Tuthill took 100 years earlier. "Chasing Grandpa" book signing and presentation. The Town of St. Michaels will get into the action with businesses becoming part of the "Chasing Grandpa" theme and decorating their businesses and dressing the part of the 1930's-1950's!